Copy of the fountain that used to be the symbol of the First Bulgarian Agriculture and Industrial Fair back in 1892, has been placed in te center of the Plovdiv International Fair grounds. It has been created by the sculptor Spas Kirichev, who has reconstructed the composition using sketches, old photos and remaining parts of the original fountain, and he believes his new fountain is the perfect replica of the original both as looks and dimentions - it is 4.7 meters tall and weighs the impressive 1350 kg. 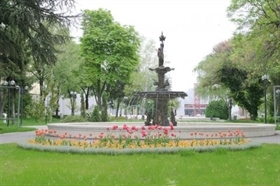 The fountain's reconstruction has been initiated by the Executive director of the Plovdiv International Fair, Georgi Gergov, on the occasion on the Fair's 115th anniversary.